Grab Malaysia to charge RM3 to RM5 cancellation fee. Grab Malaysia will start charging a fee on passengers who cancel or who are late to their ride starting from March 25. If your driver cancels the ride after waiting longer than 5 minutes for you to arrive at your pick-up point (or 3 minutes for GrabShare). The exact amount depends on the type of vehicle or service that the passenger has ordered. NOTE: All cancellations made within 5 minutes of getting a driver are free. 1. What is the update to the cancellation policy? All cancellations made within 5 minutes of getting a driver are free. 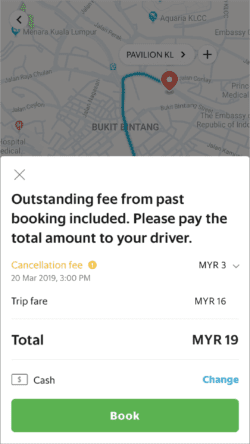 If you cancel after 5 minutes (or 3 minutes on GrabShare) of getting a ride, you will be charged between RM3 and RM5 (depending on the service you have booked). Upon arrival, your driver will wait for you for up to 5 minutes (or 3 minutes on GrabShare). If you do not show up by then, and your driver cancels your ride, you will be charged RM5. Note: For each booking, you may be charged between RM3 to RM5 for a late cancellation OR charged RM5 for not showing up on time, but not both at the same time. 2. How is this different from the previous cancellation policy? We’ve updated the policy taking into account reasons for passengers cancelling a ride and feedback from our driver-partners Based on that, we’ve made improvements to our system that will allow more flexibility for our passengers, while ensuring that our driver-partner’s time and effort is considered. 3. How will I be charged for this cancellation fee? If you’re on GrabPay, this amount will be deducted directly from your GrabPay Credits balance or credit/debit card. For passengers using cash, the fee will be added automatically to your next ride’s fare. The driver for your next trip will be informed to collect this fee on Grab’s behalf to compensate the driver for the previous ride that was cancelled. 4. Do these cancellation fees go to Grab? 100% of the fee goes to your driver when you cancel your booking late, or show up late for your ride. This compensates your driver for his or her time on the road. We expect this policy update to affect less than 1% of our bookings, as the majority of passengers don’t change their minds after booking. Just keep doing your part by being on time and booking your ride only when you’re ready to go! 5. Okay, but what if I cancel because my driver’s not moving, or taking too long to arrive? Will I get charged? We encourage you to first check in with your driver via call or GrabChat. He or she might be caught in heavy traffic, or might have accidentally missed a turn. However, if you do feel the need to cancel because your ride’s taking much longer than indicated to arrive, you will not be charged. Just as we’re able to show you your driver’s current location, we have safeguards in place to detect if the driver’s not moving towards you. Cancellation fees will also be waived if your driver does not arrive within 10 minutes after the first-shown estimated time of arrival. For example, if you are allocated a driver who is 3 minutes away, but you’ve waited for more than 13 minutes, your cancellation fee will be waived. 6. My driver cancelled the ride immediately after arriving, and did not wait for me. Will I still get charged? No, all drivers are required to wait for at least 5 minutes (or 3 minutes for GrabShare) before a fee can be charged. 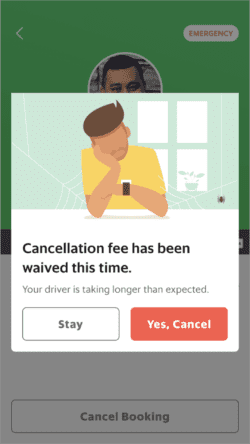 If your driver cancels the ride before this waiting time is up, you will not be charged, but rest assured, the necessary penalty will be taken. We’re constantly introducing improvements to our system based on feedback from our users as part of our commitment to drive a #BetterEveryday for everyone. 7. What if my driver indicates that he or she has arrived, but is not at my pick-up location? Will I be charged for not showing up? We have mechanisms in place that can help determine if a driver is at your pick-up locations or not. In such situations, you will not be charged for ‘not showing up’. 8. I have been waiting for my driver to turn up but he has not shown up according to the Grab app’s estimated time. Will I be charged if I cancel my ride? Cancellation fees will be waived if your driver does not arrive within 10 minutes after the first-shown estimated time of arrival. For example, if you are allocated a driver who is 3 minutes away, but you’ve waited for more than 13 minutes, your cancellation fee will be waived.